Fresh off the back of their fantastic performance at British Summer Time Festival in London’s Hyde Park, supporting Tom Petty and the Heartbreakers, Stevie Nicks and The Lumineers, folk-Americana group The Wandering Hearts reveal their new single ‘Devil’, out on Decca Records today. Following the release of their successful debut ‘Wish I Could’, ‘Devil’ further showcases the band’s knack for telling stories and writing undeniably catchy lyrics. With a melody that is sure to have listeners humming along for days, ‘Devil’ is a driving song that’s one of the band’s favourites to play live. 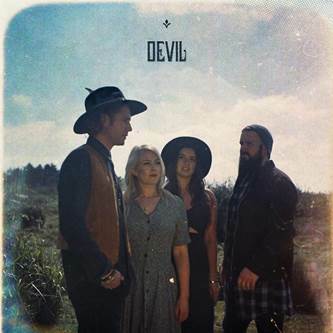 A beautiful balance of harmonies, ‘Devil’ seamlessly blends the band’s powerful male and female vocals, channelling the likes of Fleetwood Mac, First Aid Kit and Chris Stapleton. To say The Wandering Hearts have been on a whirlwind journey over the past year is an understatement. Band members AJ, Chess, Tim and Tara are all grafters, working hard to hone their skills as musicians, and the standard really is there to be seen. Hearing how effortlessly their voices blend together, it’s incredible to believe that they met almost by chance 18 months ago. Their love of folk-Americana music, vocal harmonies and gin drew them together, and one afternoon in an empty bar room of the Earl Haig Hall in Crouch End, The Wandering Hearts were born. Discovered within half an hour of uploading their first demo online, The Wandering Hearts signed a major recording deal with Decca Records shortly after. This year has seen the band play a sold-out headline show at St Pancras Old Church and support Ward Thomas before kicking off their festival season at Red Rooster, Cornbury and BST Hyde Park. Music-lovers can catch them at a string of festivals in July. The Wandering Hearts are currently working on their album with producer Pete Hammerton, which promises to be an exciting debut, due for release in October 2017.